One of the great things about getting hitched, besides the obvious, is trying out different venues for our reception, mainly the food. Because honestly, I've eaten in some real dives in the name of a good dish, so the place better have some damn good food. 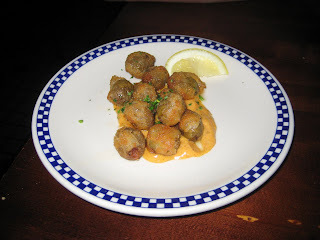 We recently tried Tapas Barcelona in Evanston, which is a cute little bistro with drinks and Spanish-style appetizers. We started with sangria. And in the name of research , we tried both the red and the white sangria. The red was savory and more full bodied, whereas the white (my favorite) was citrusy and light. The average person orders two tapas dishes. Tim and I tried several things, including black olives stuffed with chorizo and deep fried, then served in a tomato sauce. It was delicious -- salty, crunchy and tangy, too. 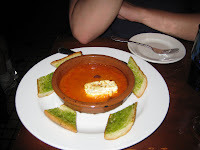 The second course was goat cheese baked in tomato sauce with olives served with garlic bread. It was also pretty tasty, but not enough cheese for the amount of tomatoes. 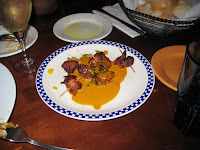 A stand out was the dates wrapped in bacon and served in a bell pepper sauce. The dates were delicious and the sauce they were served tasted a bit like caramel. I sopped it all up with some tasty white bread served with the dinner. The final thing was grilled crab cakes with sherry mayonnaise. I was not a fan. It really tasted just like a fish stick. Not pleasant. Overall, the food was tasty and the sangria refreshing. We decided against this place, though, because it wasn't big enough and would have had a weird layout for seating. Also, the patio overlooks a pool at a a nursing home. Not the kind of ambiance I was going for. Finally, the service sucked. Our waitress talked to her friends seated at another table while we went without water or the check and our used plates piled up. If that doesn't bother you, I really recommend the food.